Ok, I must admit, this months scrapbook club layout is a little over-the-top! I just had so much fun playing with the accents on this page I couldn't stop! I loved working with the Sending Love Specialty dsp and the color pink! 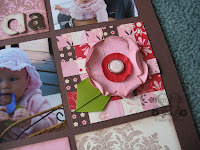 I so rarely scrapbook with the color pink because my daughter is not a pink girl. Actually she really dislikes the color - that's the tomboy in her. The photos that I chose to scrapbook are of my sweet niece Abby, whom I've only ever met once because they live out east and we rarely get to visit. Here is a better photo of the right page. As you can see there are so many different elements on this layout. 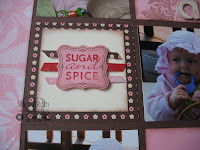 I usually try to pick a topic or product to focus on each month and this month was different uses for your dsp scraps. There are so many things you can do with those tiny little pieces that you have left over! On one of the accent squares I created a little quilted square with strips of dsp. The flower was done using the Fancy Flower punch (118073) from the Occasions Mini catalogue and the brad in the centre is one of the Pretty in Pink Epoxy brads (117271). On this accent square I used some very narrow strips to add a bit of color in behind my punched piece. A larger piece was also used to mat the vanilla square. This accent piece showcases how you can cut out different parts of your dsp to add to a page and the use of a dsp ribbon strip. 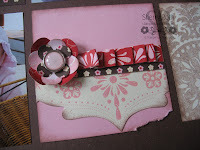 A couple small scraps were also used with the Floral Fusion die (115969) to create the flower accent. I think this is one of my favorite layouts that I've done so far. I'd love to hear what you think!